RS Components has had a major expansion of its portfolio of pneumatic components with the launch of a full range of very competitively priced RS Pro devices. The company has offered a wide range of RS Pro tubing and hose products for many years, but this launch realises a significant pneumatic portfolio extension. 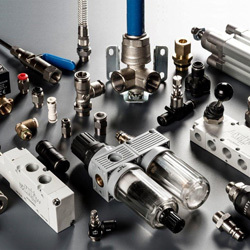 Providing a significant value-for-money alternative and offered directly from stock, more than 1000 products have been added to their portfolio, including cylinders, actuators and valves incorporating solenoid types, as well as a range of air-preparation and air-treatment devices and a broad range of fittings and quick connect couplings. These new components are aimed at machine builders and maintenance engineers who are working on applications such as production lines, conveyor systems, material handling or packaging machines.